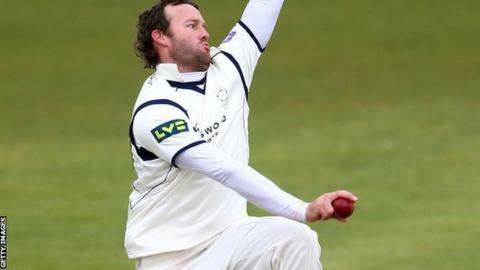 Hampshire seized the initiative on the opening day against Glamorgan with a dominant all-round performance. Glamorgan were all out for 224 after Mark Wallace (67 not out) and Tom Helm (17) shared a last-wicket stand of 65. Hampshire have not lost to Glamorgan in the Championship since 1991. In 18 meetings since then, they have won 11, with the other seven ending in draws. Kyle Abbott, Sean Ervine and Matt Coles took three wickets apiece, with wicketkeeper Michael Bates and slip Liam Dawson claiming four catches each. Hampshire then tightened their grip to reach 119-1 at stumps, with Michael Carberry on 62 and Dawson 37 not out. It was the kind of authoritative batting the Welsh county were unable to produce, with Will Bragg, who made 49, the only one apart from Wallace to make a significant score after they had lost both openers with only 12 on the board. Bates and Dawson backed up their bowlers with some superb catching, with the former's eye-catching dive down the legside to remove Murray Goodwin for 23 off Coles typical of a committed fielding effort by the home side. Glamorgan also struck early with the ball when Jimmy Adams was caught behind off Graeme Wagg for 13, but Carberry struck a six and seven fours as he and Dawson added 87 to put his side in position to build a sizeable first-innings advantage. "Winning the toss and wicketkeeper Michael Bates taking a superb one-handed catch to dismiss Jacques Rudolph first up, got Hampshire's day off to a superb start, and they never let up. "Despite only taking four wickets before lunch, they turned the screw by taking 5-55 in the afternoon session before Mark Wallace and Tom Helm's last-wicket stand helped the away side to a respectable total. "At the close and on an increasingly easy-paced wicket, Hampshire had knocked off 119 of those for the loss of Jimmy Adams. If they bat decently on day two, the home side will be way ahead in the game."